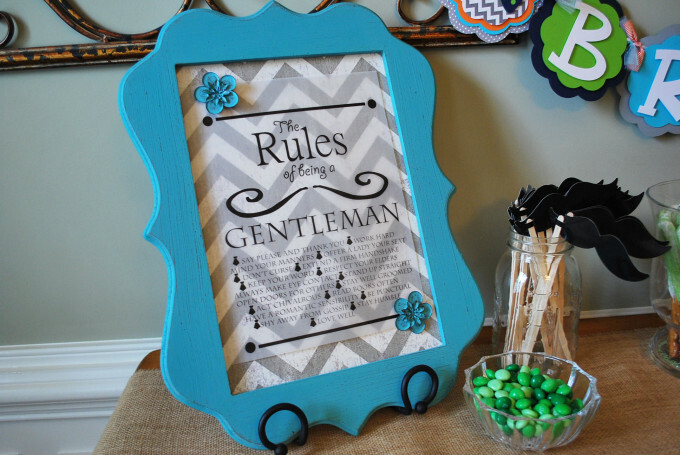 A southern gentleman baby shower includes a theme that centers around the traits and characteristics of a true southern gentleman. 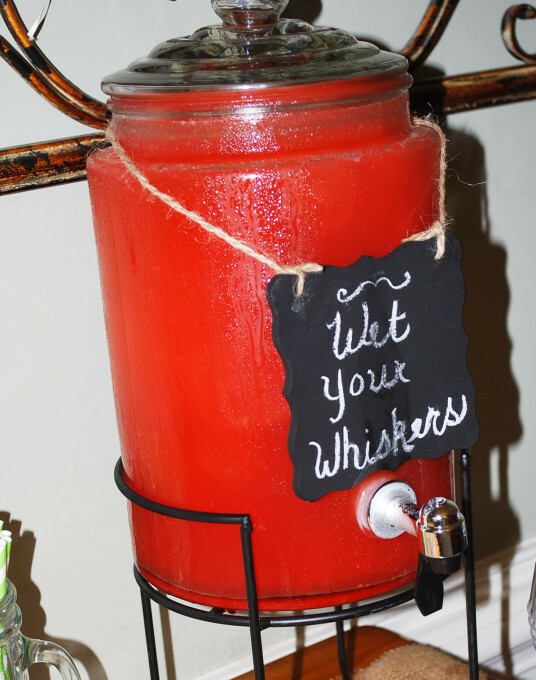 These fun and easy baby shower ideas will help you throw a baby shower for a southern gentleman father-to-be, or a soon-to-be southern gentleman baby! 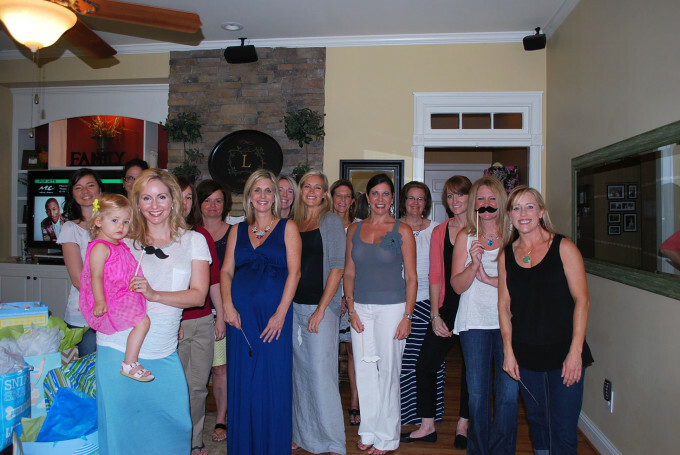 This past weekend, I had the pleasure of throwing my friend, Laurie, a baby shower. Her nursery is an eclectic “Southern Gentleman” theme, so I wanted to incorporate elements from the room into her shower motif. 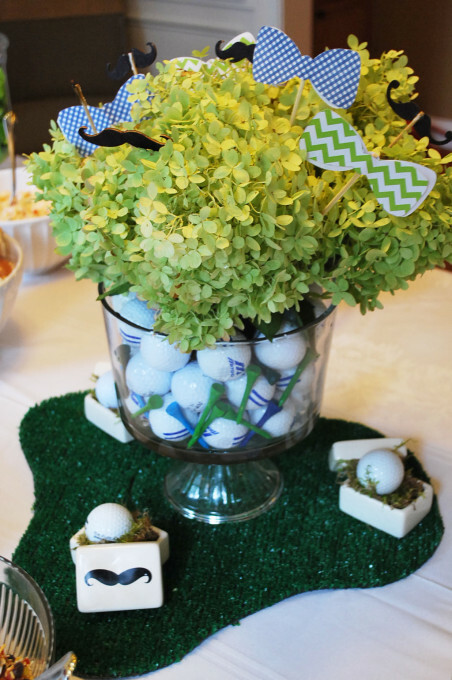 She has golf, bow ties, football and a few other things that complete her decor. 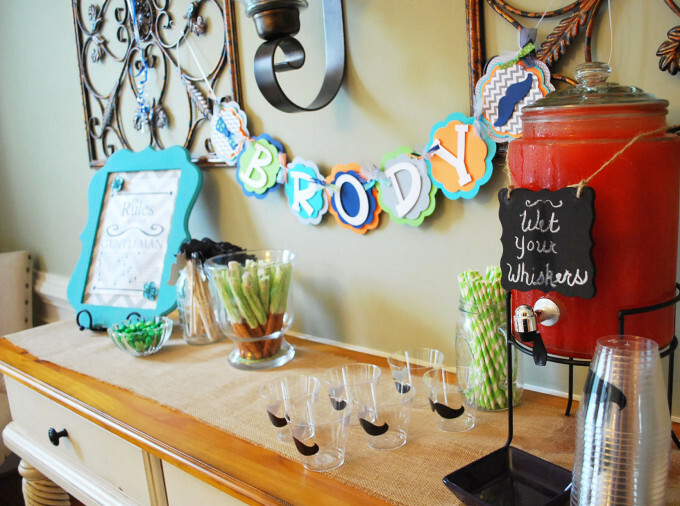 I just love the fun blend of decorating themes she used and I pulled it together into this mustache, bow tie and golf baby shower. If you ask me, I think it turned out pretty cute. 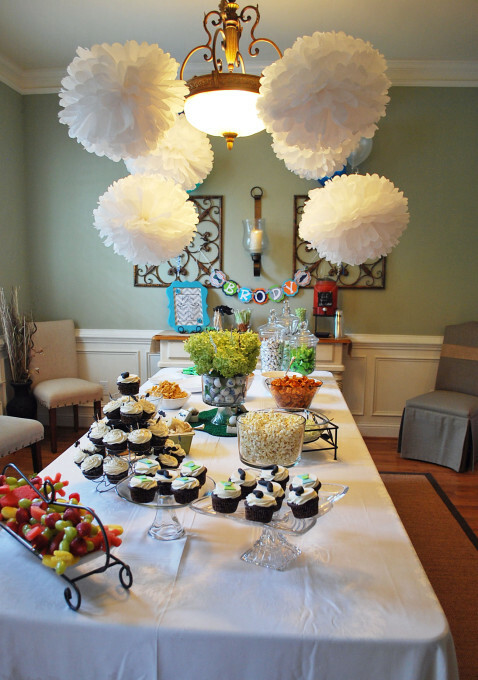 Pom Poms were hung from the ceiling to add some spice to the decor and add fun dimension to the room. 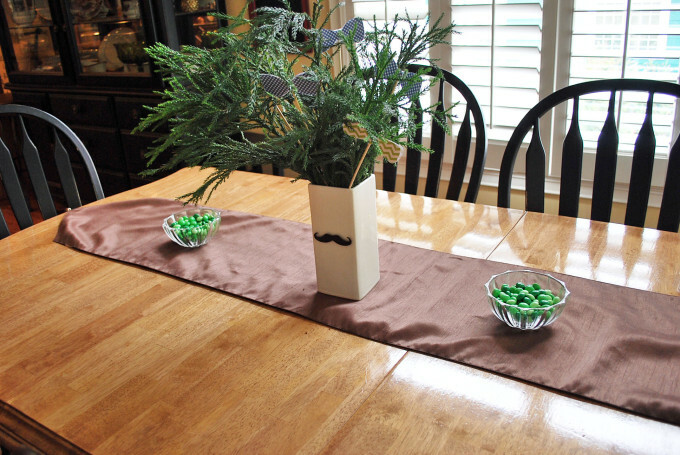 My Interior Designer neighbor, Betty, created this fun centerpiece tying the golf, mustache and bow tie theme together. She used hydrangeas from another neighbor’s yard (with permission, of course ;), golf balls, tees, picks with bow ties and mustaches and fake grass from Home Depot. Aren’t these cupcake toppers the best?!! I ordered these from Parker’s Flour Patch on Etsy. LOVE them. I made Surprise Inside Devil’s Food Cupcakes (Oreo in the middle) with Vanilla Bean Buttercream Frosting. 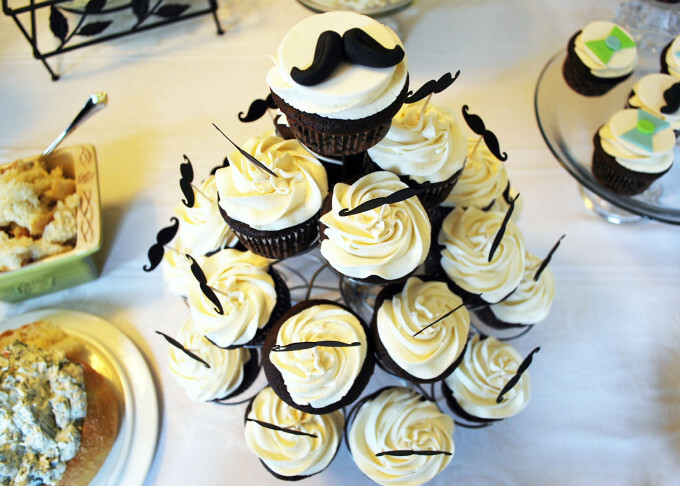 I also used mustache picks for the extra cupcakes. 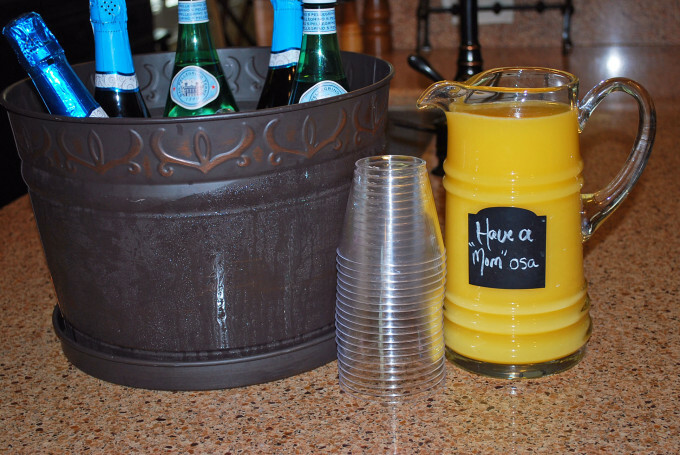 The shower menu included: Homemade Southern-Style Pimento Cheese with Hawaiian rolls, Southern Pulled Pork Barbecue, Slaw, Spinach Dip in a Bread Bowl, Fruit Kabobs, Popcorn, Sweet Potato Chips, Cupcakes, Mimosas, Punch and Tea. 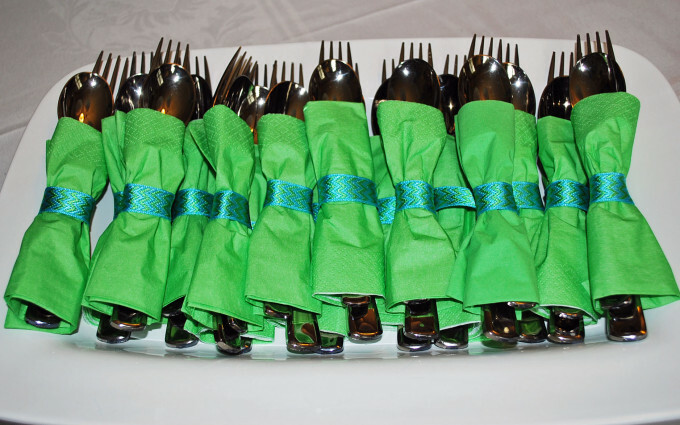 My mom was in town visiting and I recruited her to make these cute utensils wrapped up like bow ties. I think she did a fabulous job! 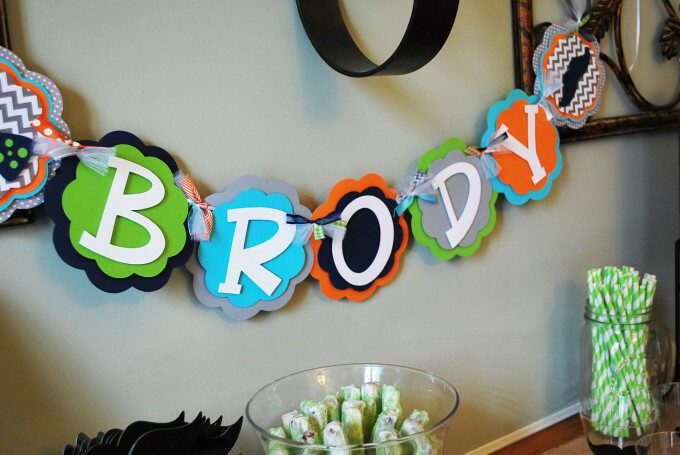 This baby name sign was created by Paisley Greer on Etsy. I found mustache stickers at Hobby Lobby and just added them onto plain plastic cups and the goodie bags. 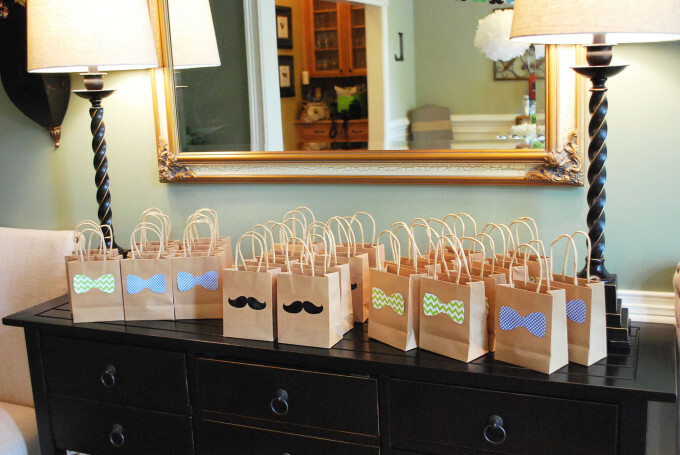 The goodie bags were made from small, plain paper bags with bow ties cut out by a Cricut machine and mustache stickers on the back. I made homemade Rice Krispie Treats to fill the bags. 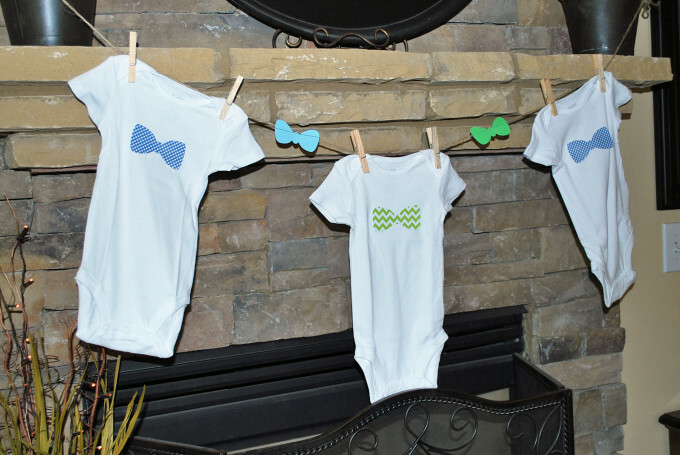 and hung onesies on twine with clothespins and attached a cut out bow tie on each one. The kitchen table was decorated with another simple arrangement of greenery made by my friend, Betty. 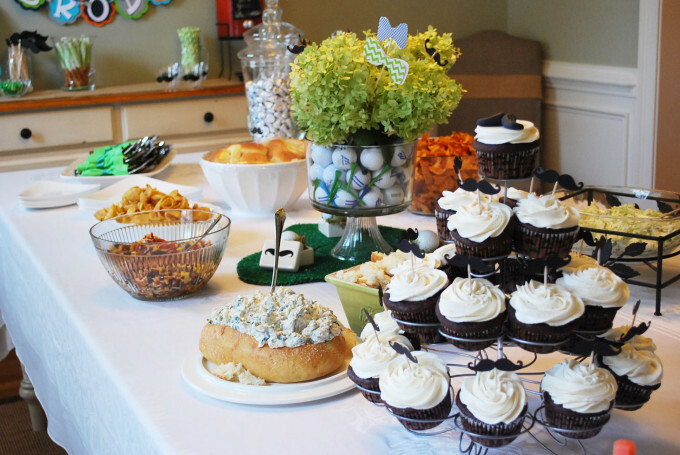 The dishes are filled with mint M&M’s. OMG, have you tried those yet?! So good! 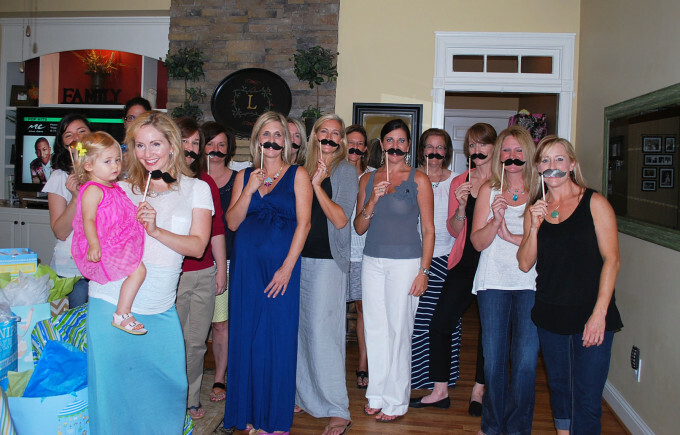 Here we are posing with our ‘stache’s…. It was a fun day and I hope that Laurie felt special and loved! 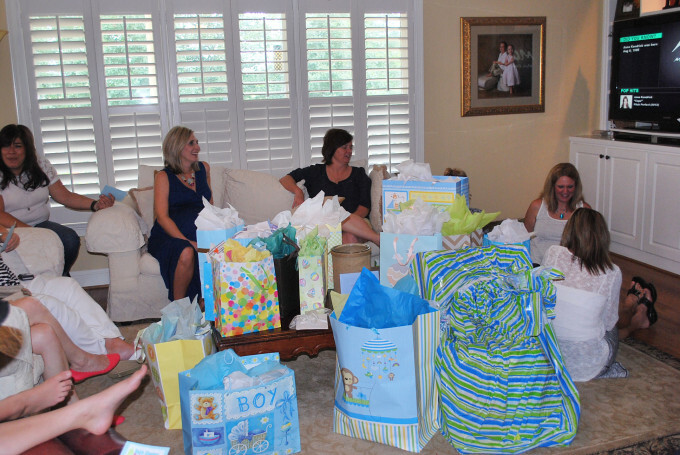 We all can’t wait to meet the true southern gentleman, baby Brody! I LOVE it! I love every single thing! What a wonderful hostess you are! So much fun!! What an amazing job and everything is so so cute! Thank you Isabel! It was a lot of fun! Wow, that is all soooooo cute! 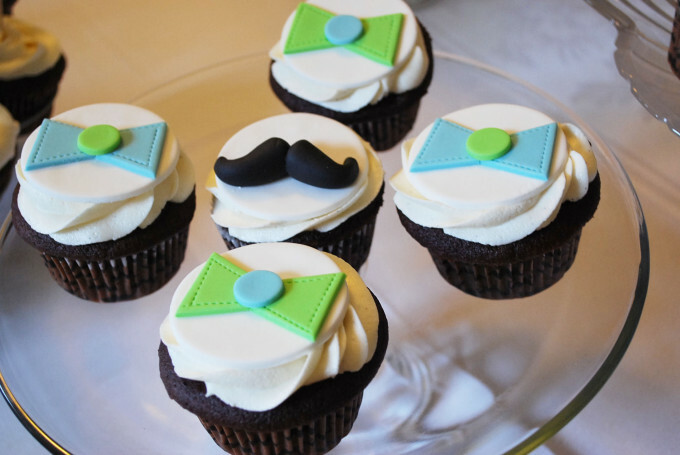 I am planning on making mustache cupcakes for my son’s bday next week — but I just got the those Wilton sugar candies. I’m such a crafting loser . . . Awe, thank you Janice! That made my day! It was a fabulous baby shower., and I had a great time. The food and decor were perfect. Thank you Madelyn! It was great to see you. I can’t wait to hold that sweet boy! It really turned out so pretty and oh, those cupcakes are sweet and awesome. I love the way your interior friend designed that centerpiece, it’s so cute. Congrats for a job well done!